Not to be confused with Trichrome. Fossil stellate hair (trichome) probably of an oak, in Baltic amber; width of image about 1,00 mm. Trichomes (/ˈtraɪkoʊmz/ or /ˈtrɪkoʊmz/), from the Greek τρίχωμα (trichōma) meaning "hair", are fine outgrowths or appendages on plants, algae, lichens, and certain protists. They are of diverse structure and function. Examples are hairs, glandular hairs, scales, and papillae. A covering of any kind of hair on a plant is an indumentum, and the surface bearing them is said to be pubescent. 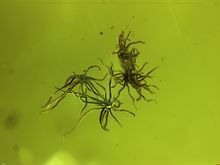 Certain, usually filamentous, algae have the terminal cell produced into an elongate hair-like structure called a trichome. [example needed] The same term is applied to such structures in some cyanobacteria, such as Spirulina and Oscillatoria. The trichomes of cyanobacteria may be unsheathed, as in Oscillatoria, or sheathed, as in Calothrix. These structures play an important role in preventing soil erosion, particularly in cold desert climates. The filamentous sheaths form a persistent sticky network that helps maintain soil structure. 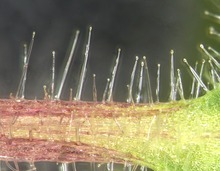 Sticky trichomes of a carnivorous plant, Drosera capensis with a trapped insect, contain proteolytic enzymes. Trichomes on Cannabis, rich in cannabinoids. Scanning electron micrograph of a trichome on a leaf Arabidopsis thaliana. The structure is a single cell. 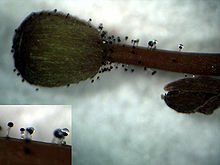 A common type of trichome is a hair. Plant hairs may be unicellular or multicellular, branched or unbranched. Multicellular hairs may have one or several layers of cells. Branched hairs can be dendritic (tree-like) as in kangaroo paw (Anigozanthos), tufted, or stellate (star-shaped), as in Arabidopsis thaliana. 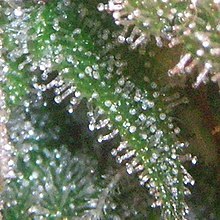 Another common type of trichome is the scale or peltate hair, that has a plate or shield-shaped cluster of cells attached directly to the surface or borne on a stalk of some kind. Common examples are the leaf scales of bromeliads such as the pineapple, Rhododendron and sea buckthorn (Hippophae rhamnoides). Any of the various types of hairs may be glandular, producing some kind of secretion, such as the essential oils produced by mints and many other members of the family Lamiaceae. The size, form, density and location of hairs on plants are extremely variable in their presence across species and even within a species on different plant organs. Several basic functions or advantages of having surface hairs can be listed. It is likely that in many cases, hairs interfere with the feeding of at least some small herbivores and, depending upon stiffness and irritability to the palate, large herbivores as well. Hairs on plants growing in areas subject to frost keep the frost away from the living surface cells. In windy locations, hairs break up the flow of air across the plant surface, reducing transpiration. Dense coatings of hairs reflect sunlight, protecting the more delicate tissues underneath in hot, dry, open habitats. In addition, in locations where much of the available moisture comes from fog drip, hairs appear to enhance this process by increasing the surface area on which water droplets can accumulate. Both trichomes and root hairs, the rhizoids of many vascular plants, are lateral outgrowths of a single cell of the epidermal layer. Root hairs form from trichoblasts, the hair-forming cells on the epidermis of a plant root. Root hairs vary between 5 and 17 micrometres in diameter, and 80 to 1,500 micrometres in length (Dittmar, cited in Esau, 1965). Root hairs can survive for two to three weeks and then die off. At the same time new root hairs are continually being formed at the top of the root. This way, the root hair coverage stays the same. It is therefore understandable that repotting must be done with care, because the root hairs are being pulled off for the most part. This is why planting out may cause plants to wilt. The genetic control of patterning of trichomes and roots hairs shares similar control mechanisms. Both processes involve a core of related transcription factors that control the initiation and development of the epidermal outgrowth. Activation of genes that encode specific protein transcription factors (named GLABRA1 (GL1), GLABRA3 (GL3) and TRANSPARENT TESTA GLABRA1 (TTG1)) are the major regulators of cell fate to produce trichomes or root hairs. When these genes are activated in a leaf epidermal cell, the formation of a trichrome is initiated within that cell. GL1, GL3. and TTG1 also activate negative regulators, which serve to inhibit trichrome formation in neighboring cells. This system controls the spacing of trichomes on the leaf surface. Once trichome are developed they may divide or branch. In contrast, root hairs only rarely branch. During the formation of trichomes and root hairs, many enzymes are regulated. For example, just prior to the root hair development, there is a point of elevated phosphorylase activity. The type, presence and absence and location of trichomes are important diagnostic characters in plant identification and plant taxonomy. In forensic examination, plants such as Cannabis sativa can be identified by microscopic examination of the trichomes. Although trichomes are rarely found preserved in fossils, trichome bases are regularly found and, in some cases, their cellular structure is important for identification. In the model plant Arabidopsis thaliana, trichome formation is initiated by the GLABROUS1 protein. Knockouts of the corresponding gene lead to glabrous plants. This phenotype has already been used in genome editing experiments and might be of interest as visual marker for plant research to improve gene editing methods such as CRISPR/Cas9. 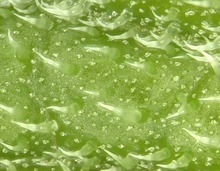 Trichomes also serve as models for cell differentiation as well as pattern formation in plants. Bean leaves have been used historically to trap bedbugs in houses in Eastern Europe. 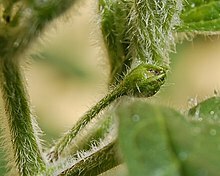 The trichomes on the bean leaves capture the insects by impaling their feet (tarsi). The leaves would then be destroyed. Trichomes are an essential part of nest building for the European wool carder bee (Anthidium manicatum). This bee species incorporates trichomes into their nests by scraping them off of plants and using them as a lining for their nest cavities. Plants may use trichomes in order to deter herbivore attacks via physical and/or chemical means, e.g. in specialized, stinging hairs of Urtica (Nettle) species that deliver inflammatory chemicals such as histamine. Studies on trichomes have been focused towards crop protection, which is the result of deterring herbivores (Brookes et al. 2016). However, some organisms have developed mechanisms to resist the effects of trichomes. The larvae of Heliconius charithonia, for example, are able to physically free themselves from trichomes, are able to bite off trichomes, and are able to form silk blankets in order to navigate the leaves better. Stinging trichomes vary in their morphology and distribution between species, however similar effects on large herbivores implies they serve similar functions. In areas susceptible to herbivory, higher densities of stinging trichomes were observed. In Urtica, the stinging trichomes induce a painful sensation lasting for hours upon human contact. This sensation has been attributed as a defense mechanism against large animals and small invertebrates, and plays a role in defense supplementation via secretion of metabolites. Studies suggest that this sensation involves a rapid release of toxin (such as histamine) upon contact and penetration via the globular tips of said trichomes. ^ "Identify That Alga". Retrieved September 20, 2013. ^ Schellmann, S.; Schnittger, A.; Kirik, V.; Wada, T.; Okada, K.; Beermann, A.; Thumfahrt, J.; Jürgens, G.; Hülskamp, M. (2002-10-01). "TRIPTYCHON and CAPRICE mediate lateral inhibition during trichome and root hair patterning in Arabidopsis". The EMBO Journal. 21 (19): 5036–5046. doi:10.1093/emboj/cdf524. ISSN 0261-4189. PMC 129046. PMID 12356720. ^ Schellmann, Swen; Hulskamp, Martin (2004-09-01). "Epidermal differentiation: trichomes in Arabidopsis as a model system". The International Journal of Developmental Biology. 49 (5–6): 579–584. doi:10.1387/ijdb.051983ss. ISSN 0214-6282. ^ Dosier, Larry W.; Riopel, J. L. (1977). "Differential Enzyme Activity During Trichoblast Differentiation in Elodea canadensis". American Journal of Botany. 64 (9): 1049–1056. doi:10.2307/2442160. JSTOR 2442160. ^ Davis, P.H. ; Heywood, V.H. (1963). Principles of angiosperm taxonomy. Princeton, New Jersey: Van Nostrandpage. p. 154. ^ Bhatia, R.Y.P. ; Raghavan, S.; Rao, K.V.S. ; Prasad, V.N. (1973). "Forensic examination of leaf and leaf fragments in fresh and dried conditions". Journal of the Forensic Science Society. 13 (3): 183–190. doi:10.1016/S0015-7368(73)70794-5. ^ United Nations Office on Drugs and Crime (2009). Recommended Methods for the Identification and Analysis of Cannabis and Cannabis Products (Revised and updated). New York: United Nations. pp. 30–32. ISBN 9789211482423. ^ Hahn, Florian; Mantegazza, Otho; Greiner, André; Hegemann, Peter; Eisenhut, Marion; Weber, Andreas P. M. (2017). "An Efficient Visual Screen for CRISPR/Cas9 Activity in Arabidopsis thaliana". Frontiers in Plant Science. 8. doi:10.3389/fpls.2017.00039. ISSN 1664-462X. PMC 5258748. PMID 28174584. ^ Hahn, Florian; Eisenhut, Marion; Mantegazza, Otho; Weber, Andreas P. M. (5 April 2018). "Homology-Directed Repair of a Defective Glabrous Gene in Arabidopsis With Cas9-Based Gene Targeting". Frontiers in Plant Science. 9. doi:10.3389/fpls.2018.00424. ^ Hülskamp, M.; Schnittger, A.; Folkers, U. (1999). "Pattern formation and cell differentiation: trichomes in Arabidopsis as a genetic model system". International Review of Cytology. 186: 147–178. doi:10.1016/S0074-7696(08)61053-0. ISSN 0074-7696. PMID 9770299. ^ Szyndler, M.W. ; Haynes, K.F. ; Potter, M.F. ; Corn, R.M. ; Loudon, C. (2013). "Entrapment of bed bugs by leaf trichomes inspires microfabrication of biomimetic surfaces" (PDF). Journal of the Royal Society Interface. 10 (83): 20130174. doi:10.1098/rsif.2013.0174. ISSN 1742-5662. PMC 3645427. ^ Eltz, Thomas; Küttner, Jennifer; Lunau, Klaus; Tollrian, Ralph (6 January 2015). "Plant secretions prevent wasp parasitism in nests of wool-carder bees, with implications for the diversification of nesting materials in Megachilidae". Frontiers in Ecology and Evolution. 2. doi:10.3389/fevo.2014.00086. ^ Karley, A (2016). "Exploiting physical defence traits for crop protection: leaf trichomes of Rubus idaeus have deterrent effects on spider mites but not aphids". Annals of Applied Biology. 168: 159–172. doi:10.1111/aab.12252 – via Academic Search Premier. ^ Cardoso, Márcio Z (2008). "Ecology, Behavior and Binomics: Herbivore Handling of a Plant's Trichome: The Case of Heliconius Charithonia (L.) (Lepidoptera:Nymphalidae) and Passiflora Lobata (Kilip) Hutch. (Passifloraceae)". Neotropical Entomology. 37 (3): 247–52. doi:10.1590/s1519-566x2008000300002. ^ Fu, H. Y.; Chen, S. J.; Kuo-Huang, L. L. (2003). "Comparative study on the stinging trichomes and some related epidermal structures in the leaves of Dendrocnide meyeniana, Girardinia diversifolia, and Urtica thunbergiana". Taiwania. 48 (4): 213–223.